Dairy-free, gluten-free twist on strawberry shortcake ... without the cake! Place strawberries in a large bowl. Add balsamic vinegar and mix well. Spread strawberries in a single layer on prepared pan. Roast for 40 to 45 minutes, rotating the pan and loosening the strawberries after 25 minutes. Set aside to cool. Place coconut milk in the refrigerator to chill overnight. About an hour before you're ready to whip the cream, place your mixing bowl and beaters (or whisk) in the refrigerator. Remove chilled can and turn it upside down. Open can and pour off liquid (see note below). Save the liquid for another use (e.g. smoothies). Spoon the coconut cream solids into your chilled mixing bowl. Whip until fluffy. Add vanilla and maple syrup and whip again. 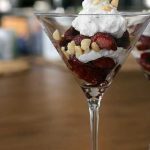 Layer cooled strawberries, coconut cream, and macadamia nuts in glasses or small bowls. The coconut cream technique pretty much belongs to Oh She Glows. If you don't see liquid on top when you open the can of chilled coconut milk, use a spoon to poke through just along the edge of the can. Then you should be able to pour off the liquid. Oh She Glows also says to look for coconut milk that does not contain guar gum, but I couldn't find any. My cream may not look as fluffy as hers, but it still tasted good. This may seem like a lot of fat, but research is starting to show that people with diabetes may benefit from eating more "good" fat (such as the fat from coconuts and macadamia nuts). Read Dr. Mark Hyman's new book, Eat Fat, Get Thin, to learn more.